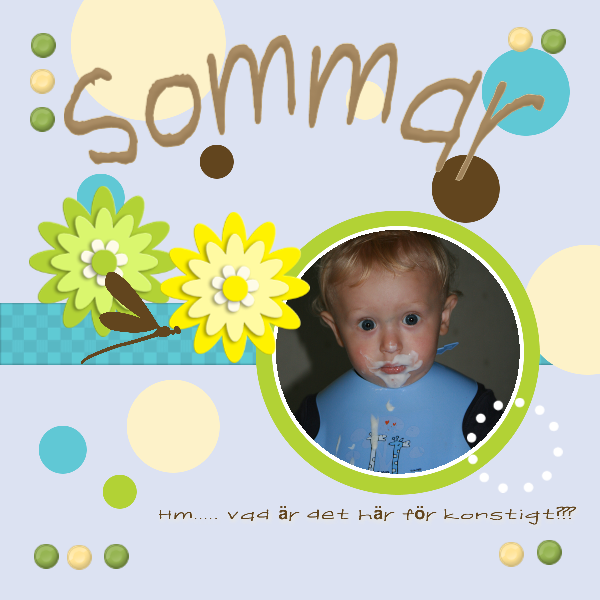 Here's my very first one that I've done with Isac as a baby boy - trying his very first ice-cream. Look at his cute little face - wondering: Hm.......what's this??? Sentiment Sommar (= Summer in Swedish) is done by using WordArt that's available in the software. Added flowers, ribbon and brads to the dotted paper and a little firefly. I really love how easy and self-explanatory this software is. So many things you can do and it's so easy to change colours, add embellies, moving items around. Also - who didn't say that all of you cardmaking ladies out there can't make a card with this program as well. I created one using 6x6 below. You can of course print it and have it in your 6 x 6 album or you can send it as an e-card to your loved ones. Illustration of the little girl with doll is made by myself. You can also create your very own beautiful scrapbook albums in different sizes using this amazing software and having a lot of fun with it. I guess that a lot of you are like me - you have tons of digital photos from vacations, birthdays, family events and they are stuck on your hard drive. Well - now you can actually in one go - create lovely memories using the software from My Memories. So what's up for grabs? Well - I have 1 My Memories Suite Software that I will be giving out to 1 lucky winner. What do you need to do in order to participate? 1. I would love it if you could tell your blog friends about the Give Away and link back to my post. 2. Visit My Memories web-site and check out their products. 3. Come back to my blog and let me know what you like the most. an email if you would like to participate in the Give Away). I will pick the lucky winner on March 18th. This post will stay on top until the lucky winner have been chosen by using random org. As a special for all of my readers, I also have been given my very own "Share the Memories" code that provides a $10 discount off the purchase of the My Memories Suite Scrapbook software and a $10 coupon for the MyMemories.com store - $20 value! Simply go to My Memories and use STMMMS90477 in the promo code box on the shopping cart. Happy shopping and to all of you that want to participate in the Give Away - good luck! Then Isac had a friend over. Hubby went to my parents for a minor repair on one of our vehicles - so I actually got a few hours free. My afternoon fun resulted in a little image for my newborn niece Agnes. 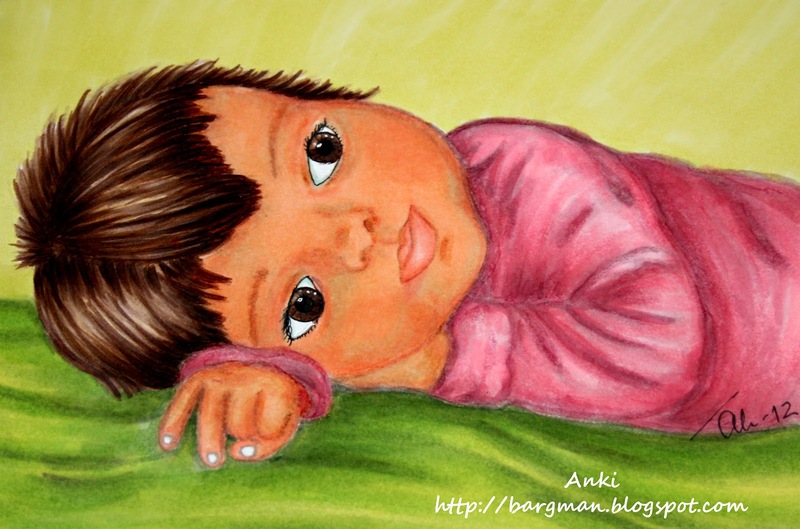 I did a quick sketch and then I coloured this baby girl with my copic sketch. Also - Happy b'day also to my sister Louise (Agnes mother) who's celebrating her birthday today! 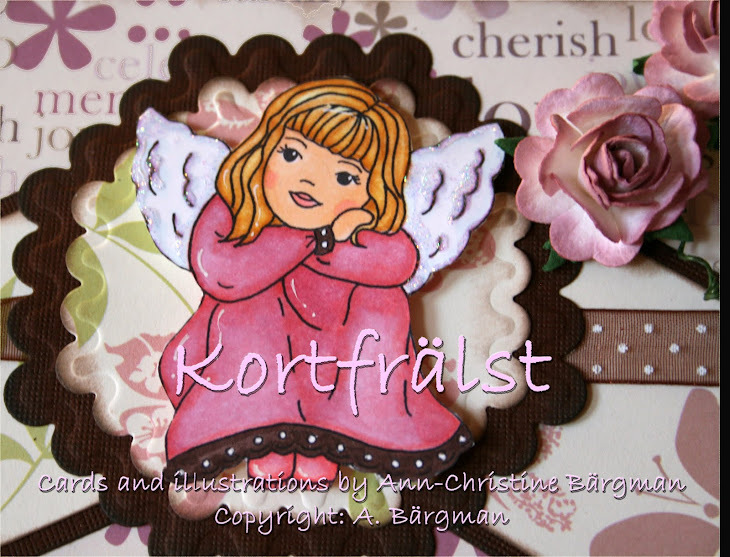 Just wanted to pop by and show you a card that I made for my godson Johannes when he turned 14 in January. Today is my very last post as a DT member of SCACD. I really love being part of this team, but sometimes the day-to-day life takes too much time and you need to slow down. This mean that I will not be blogging as frequently as I have before. Susana - I'm so happy that you found me in the "blog-land" and I cherish our friendship a lot. I do hope that we one day will be able to meet in person. You made me start to draw again - something that I now hope to be able to get the time to pick up and improve. This led to my very own stamp line - Anki's Sweethearts. Thank you so much Susana for believing in me and making me step out of my "comfort zone". A huge warm thank you to my DT-sisters as well. The SCACD family is the most loving and caring one. Susana - Love you Hermana! I hope that you didn't miss the SCACD release yesterday? Today I have a little card in colours - not that common for me - purple and pink to show you. I coloured Daphne's tea party with my copics. Added pearls, lace (the purple one is a purple "flower" lace) a bunch of flowers and a little pink butterfly. 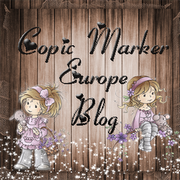 Happy Friday ladies and welcome to the SCACD blog hop. Today I have 2 projects to show you - one with Friendship ties - by Sylvia Zet for SCACD. and one with If the shoe fits by Victoria Case for SCACD. I made a litte card using "If the shoe fits". Wanted some bright and fun colours for this darling image. Sentiment stating in Swedish Du får mig att le = You make me smile. For my next project I decided to make a little canvas for my newborn niece Agnes (she's born Jauary 28th). I coloured Friendship ties with my copics. I guess I'm really longing for Spring since the Winter arrived very late (end January/February) here in Sweden. Today we have - 17 C....brrr....... so therefore I picked bright and bold colours for this canvas. pop over to SCACD for some serious shopping *lol*. 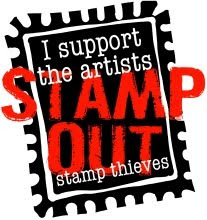 For European customers - you find these stamps over at SCACD's "sister store" - Quixotic Paperie. Make sure you check out my DT sister's blogs today and leave some love - so that you don't miss the chance to win. Make sure you come back Friday for even MORE SCACD fun! Hope you all are doing fine! Just wanted to make sure that you don't miss the SCACD fun - starting today with beautiful Sneak Peeks from 2 of our supertalented ladies - Kim and Danni! Make sure that you pop over and leave a little love on the blogs + also check out the store blog. 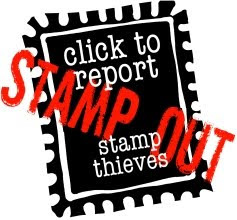 Each designer will be giving away one SURPRISE stamp from the upcoming release and I'm sure you don't want to miss that chance. So make sure to leave comments on the DT ladies blogs. They will pick a winner from their blog comments at 9 pm (EST). Kramis and make sure that you POP over to Kim and Danni's blogs.